The visit to Newquay, Cornwall: Living in Cornwall it’s such a delight to just get up and go to the nearest beach. Obviously, it’s healthy to get away from the computer screen every now and again and focus on the natural sights Cornwall has to offer. This is why I visited Newquay to get some headspace. 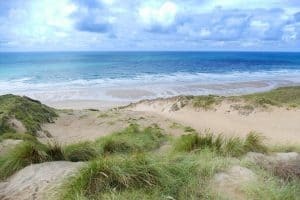 Newquay is home to many beaches including Fistral Beach, Lusty Glaze and of course Holywell Bay but in my adventure, I decided to visit Lusty Glaze – what a great place to visit! So I parked up in the top car park and to get down to Lusty Glaze you need to walk down around 100 steps (there were loads of them!). When you reach the bottom you are definitely in for a treat. When you get to the bottom you will notice straight in front of you a beach restaurant (called Lusty Glaze Beach Restaurant I think!) and of course the beach itself which is to your right. I had to visit both! I visited the restaurant and sat as close as I could to the see the view of the beach. Just sitting in the restaurant I was soaking in the rays it was that hot! I must admit this is one location I will come back to if I decided to come to Newquay to do some mobile web design. SEO Services including On-page SEO and Local Search Engine Optimisation.